The bottom side in the Euroleague plays the team that is currently third bottom so it is safe to say that this is a game with absolutely no playoff impact! There will be pride at stake and the Milan side will want to avoid being the bottom team at the end of the season, all of which means that we may see a busy game in this match on Thursday night. 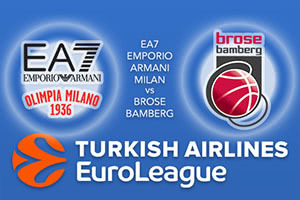 When these teams met earlier on in the season, it was Brose Bamberg who grabbed the win in a 106-102 encounter. If we can get the same points tally in this clash, we will be delighted and hopefully both teams will play with the shackles off in Milan on Thursday night. Darius Miller was hugely influential that game, grabbing 27 points, and he has played a big role in helping the Germans to one of the best offensive records in the league. Bamberg have the 6th best offensive record in the league, with 79.1 points per game and Milan have the fifth best record, with 81.1 points per game. However, the fact that Milan have the poorest defence in the league says a lot and any team that offers up an average of 87.5 points per game is going to struggle to win matches. This is evident when you look at the 7-20 record held by Milan at this point of the campaign. One player that has been in good form for Milan this season is Rakim Sanders, with an average of 13 points while Ricky Hickman has notched an average of 9.6 points per game. Miller has provided an average of 12.5 points per game for Bamberg while Nicolo Melli has notched an average of 11.4 points per game. Both sides have suffered injury problems this season and if they are being honest, both teams will be keen for this Euroleague campaign to be concluded as soon as possible. The bookies don’t think there is much between the teams and you can back Brose Bamberg at +1.5, which is provided at odds of 1.90. If you’re looking for the Over/Under market, go OVER 164.5 which is provided at odds of 1.90. Bet Now!